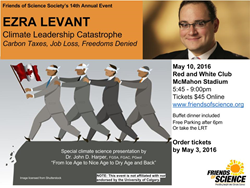 Friends of Science Society announces its speakers for their 14th Annual Event entitled “Climate Leadership Catastrophe,” featuring broadcaster, free speech advocate and author Ezra Levant and Dr. John D. Harper, former director of the Geological Survey of Canada to speak on climate change, May 10, 2016 at the Red and White Club in Calgary. Friends of Science says the recent news of the NDP's adoption of the LEAP Manifesto Resolution is an example of climate change ideology not grounded in reality. Friends of Science Society is pleased to announce the speakers for its “Climate Leadership Catastrophe” event, slated for May 10, 2016 at the Red and White Club in Calgary, featuring Ezra Levant, Canadian broadcaster, author and free speech advocate, fondly known as The Rebel Commander of web channel - The Rebel Media. Also on the podium, Dr. John D. Harper, FGSA, FGAC, P. Geol., former director of the Geological Survey of Canada, who will give a science presentation on the past 600 million years of climate change. Tickets are $45 on Eventbrite or FriendsofScience.org - tickets include a buffet dinner. Doors open at 5:45 pm. Friends of Science Society says the LEAP Manifesto that split the NDP Party Convention in Edmonton on the April 9th weekend, as reported by CBC News on April 11, 2016, is an example of the misinformed “Climate Leadership Catastrophe” gripping Canada, that is damaging the economy of the country and especially Alberta, the economic driver of the country. “Climate Leadership Catastrophe” will take a critical look at recent political events in Canada wherein the federal government made sweeping promises at the Paris COP-21 Conference in December, 2015, even pushing for a lower 1.5 degree Celsius ‘limit on warming’ as reported by the Globe and Mail Dec. 6, 2015. Friends of Science Society say these steps are catastrophic for the Canadian economy, referring to their report by Robert Lyman on the economic implications of trying to reach the previous 2 degree Celsius targets. Featured guest speaker Ezra Levant provocatively challenges group think. Levant has a long track record of standing up for freedom of speech, challenging climate catastrophe thinking, and defending Canadian resource industries. In 2002, Ezra Levant published a book called “Fight Kyoto” that predicted massive economic damage. According to Dr. Harper 600 million years of evidence show that “Carbon dioxide is a consequence of warming, not the cause.” Carbon dioxide levels have been ten times higher in geologic history and the evidence shows a regular cycle going from icy glaciation, to temperate, tropical, and extremely dry ‘evaporitization’ and back down to glaciation. “Based on Dr. Harper’s presentation, it is clear that politicians can’t stop climate change, and most of them can’t even define what it is,” says Michelle Stirling, Communications Manager for Friends of Science Society. People are urged to buy tickets prior to the May 3, 2016 cutoff. Friends of Science has spent a decade reviewing a broad spectrum of literature on climate change and have concluded the sun is the main driver of climate change, not carbon dioxide (CO2). Friends of Science is made up of a growing group of earth, atmospheric and solar scientists, engineers, and citizens.